Music Costs > How Much Does a Trumpet Cost? How Much Does a Trumpet Cost? Being used since the early 1920s, the trumpet has been a staple during the jazz era, a time when these instruments were extremely expensive. Today, however, the prices have dropped significantly, offering everyone the chance to enjoy the sound. Depending on the type, brand, condition, age and where it’s purchased, the costs of a trumpet can greatly vary anywhere from as little as $500 to as much as $8,000. A good, quality professional horn will be between the $1,500 and $4,000 price range, while a student trumpets can cost anywhere from $200 to as much as $500. A beginner’s trumpet, according to this guide, is due to the manufacturing process since most are produced in larger quantities with numerous compromises. These trumpets, on average, can cost anywhere between $300 to $500. Pro quality horns, being the next step up, will be manufactured by top brands such as Yamaha Bach and Besson. These types of trumpets from national retailers can cost 41,000 to $1,300, but you could pay about 30 percent more if you were to buy from a local music store to cover their overhead. NOTE: These are just averages and is just a chart to help you budget. At Music Arts, a national music store chain based in Frederick, Maryland, trumpets cost anywhere from $475 to $6,000. For example, the Bb trumpets can cost anywhere from $3,200 to $3,700 while the C trumpets cost $3,200 to $4,400. Piccolo trumpets can cost $4,000 to $6,000, while the slide trumpets can cost $475 to $1,500. Pocket trumpets can cost $1,700, while triumphal trumpets can cost $1,500. Lastly, bass trumpets can cost upwards of $4,300. The bore, which is the diameter of the trumpet’s tubing measured at the second valve, can range from .458″ to .460″. The larger the bore, the more power it can provide; however, it will require more effort to play. A trumpet’s finish is often a clear lacquer finish on a buffed brass surface, but some may have a silver plate finish that’s thinner when compared to the lacquer finish. A silver plate, according the Musician’s Friend, allows the metal to vibrate more, creating a brighter tone. A standard trumpet case, if you needed one, could cost $20 to $200. For example, the popular protech trumpet case retails for $110 to $180. Don’t forget to factor in music lessons if you need them. The average 30-minute lesson can cost $25 to $50, while a 60-minute lesson can cost up to $75. 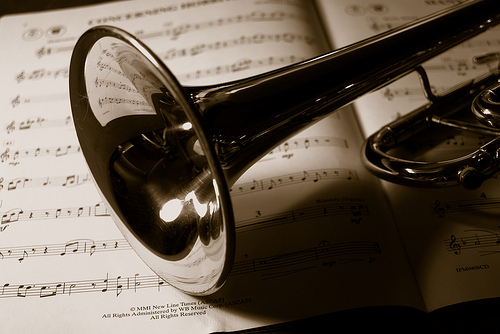 As you can see, there are many types of trumpets, so which one works for you? If it’s your first trumpet, then a Bb is highly recommended since most schools only use this type. If you’re unsure you want to invest a few hundred dollars in a new instrument, highly consider renting for a few months to see if it’s worth it. Renting can make sense as long as you don’t rent for too long. Used trumpets, as long as taken care of, can be a wonderful investment, and most used trumpets are up for sale since most give up playing or simply upgrade to a better brand. eBay, Craigslist and Facebook are great places to start to find a slightly used trumpet that could potentially save you more than 60 percent. Even if it needs service, you could save quite a bit.